Porcelain and sea glass oyster shells. These really are my favorite new things to make. I'm excited and grateful for this opportunity to show my work in such a lovely space. The pieces will be up from April 15-June 8. Opening reception is April 15, 6-8 pm. See you! Totally and completely surprised me. Because I believe I tried this same combination last year and really disliked it. But last week, after a few hard days, I decided that I just needed to take 20 minutes and make something pretty. I took two large blocks I'd carved with woodgrain, laid them out on porcelain slabs, and knocked out these two platters. On Monday, I glazed them, thinking that they'd more or less be green, but this flowing celadon really did interesting things pooling up with the copper deposits and thinning out in the thunderstorm-damp basement I glaze in. Perhaps letting go and seeing what happens is my lesson for this year? Just keep making and watching? I told you that I'd report back on the BUNNIES! Oh my word. The bunnies. I'm excited to begin cranking these little sweet things out. The test pieces were so happy and I sat down this week to make another run of ready-to-go baby cups. I think I'm also going to offer grown-up size teacups in the bouncing bunnies, as well. Several of those are thrown and waiting in my damp shelving for trimming next week. BUNNIES! And because tumblers are what *I* prefer to drink my morning coffee out of, I tested two of those, too. So there will be tumblers a plenty and teacup style cups for big bunny lovers. I am headed off on a New Orleans girls' adventure this weekend- it's far enough away that it feels like really getting away, close enough that you don't feel like you have to leave for a solid week to experience the city- and hope to come back home with a full sketchbook and lots of ideas to put into my work. Have a lovely weekend, friends! sprucing up: spring is in the air! Over the weekend I've been doing a lot of desk work- finishing up tax prep, listing items in my etsy shop, sprucing up this website with some newer photos of my work and revising how some things are listed in my shop. They are little things, like including responding to customer feedback by offering my happy bonjour latte cups in righty and lefty orientation. I started a new batch of these cups this week and made sure to have an equal number of "bonjour" script facing you, whether you hold the cup in your right or left hands! I picked up a new load of porcelain from my supplier in Nashville early this week, and I'm itching to get into it. I'm making plans for a full spring and early summer, and excited about ideas that are bouncing around. Several cousins in my family have recently had babies, so I've been thinking about sweet baby dishes and playing with the bunnies I made for last year's Hop Up Pop Up with Me and Mrs Jones! Here's a little preview before they roll out at this year's spring pop up on March 24! 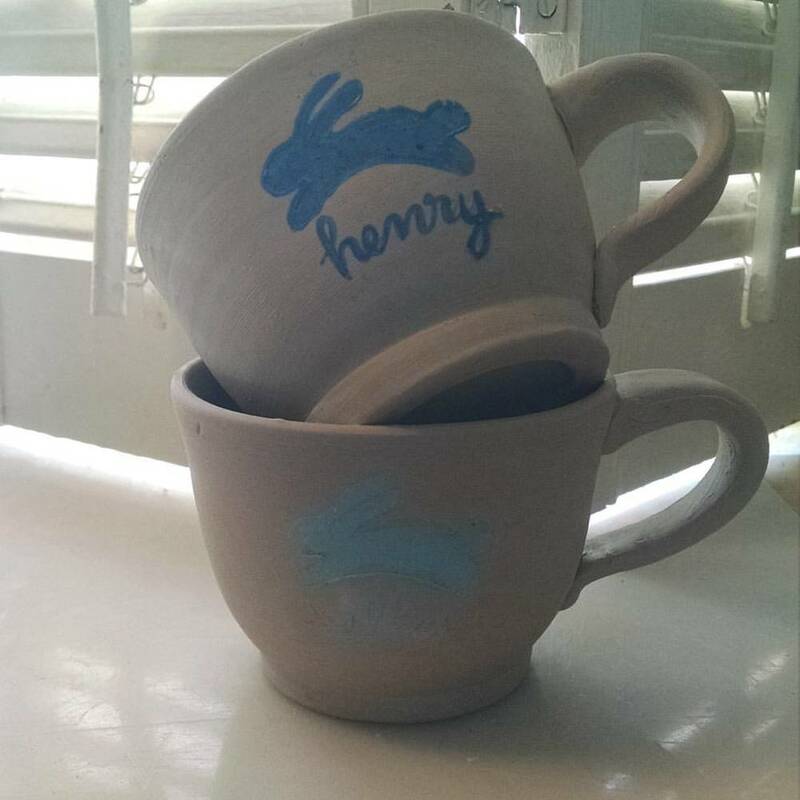 These little cobalt and aqua bouncing bunnies will be ready to go-in teacups, small bowls, little plates, and grown-up sized tumblers, too! I also have acustomizeable option for those that want a personalized gift in a different design. I just unloaded these babies from the bisque kiln and am looking forward to glazing them tomorrow! This week I finished throwing work for my April Sea and Stone show and am moving on to glazing that work and finishing the small paintings and sketches I'll be showing with that. I added a Sea and Stone section to my product lines, too, because I'm just so excited about them. I hope to one day have enough inventory to list these pieces, but until then, I'm happy to have a small showing of these special pieces up. I try to reserve one day a week for desk work- planning, taking care of taxes, listing items in my shop, communicating with my clients. It seems like this week I've done more than a single day- spreading the work out across several mornings. This morning I sat down with a new sketchbook and hammered out what I want to produce this spring. I have three events coming up in March, April, and May, and my list is growing crowded. As a visual learner and thinker, it helps me to draw pictures of what I need to do (when I was in graduate school I aced all of my art history courses by sketching out the composition in my notebooks as I took notes during slide lectures. I've found that I can still remember the lace detail on that Copley portrait. . . because of those sketches). If only taking care of the paperwork were as easy! My friend Martha and I had a great turnout at her Valentine's Studio Sale. I'm always grateful to friends and clients who come out, and it's wonderful to meet friends of friends and have clients become friends through the social interaction of these events. I've put up several of the leftover quote cups and saucers in my shop and will be adding more Mother Teresa cups in the near future. As I was packing and unpacking for this show, I took a hard look at some things I made last year, like the coffee pour over vessels, and decided that they weren't the best fit for my local market. I've just listed the last two that I have here. I'm looking forward to more spring-like weather and it's inspiring spring-like imagery on my work for the coming months. I have some sweet bunny pieces that will be hopping out on March 24 for the pre-Easter Me and Mrs Jones pop up, and I've been steadily working on my Sea and Stone collection for my April 15 show. Finally, the second annual Urban Barn Market will be happening on May 6-8. I'm so excited to be participating again! Have a lovely week, friends, and a happy Valentine's weekend. Ever since I was a college student I've viewed January as a chance to do something different. A month where the regular rules for production don't really apply (well, they do, but not like they do in the last quarter of the year) and I try my hand at something new. My college had a 4-1-4 semester system with a Jan term in the middle of the academic year given over to special studies- classes on campus, off-campus internships, travel, or independent study. I took a deep-diving course on everything Winston Churchill, did internships in a small city's Human Relations Council office (this really took me out of my comfort zone and broadened my perspectives on the ongoing struggles for civil rights in the South), worked in a historical museum in Little Rock, and finally did an intensive month of oil painting during which I completed a dozen large paintings in a small, quiet campus, working day and night in the chilly basement studio. The painting study was probably my favorite experience of the Jan Terms- something I now see as a luxury and long to repeat. After college, I tried to keep my Jan term going- learning how to knit a complicated color work sock, upholstering furniture (which I'll never do again), exploring new ceramic techniques, taking online courses (like The Clayer e-course), reading heavy books (Crime and Punishment, anyone?). I can't even remember all of the Januaries anymore. This year I've been taking a Monday class in watercolor painting, hoping to add to my skills in a more formal way. As part of that course, I've committed to working in watercolors several days a week in my sketchbook and in larger format, and this has led me to revisit an idea that I've had in the past, of treating my ceramic pieces as a canvas for my sketches. Part of this watercolor/sketchbook porcess included a piece I donated to the Memphis Botanic Garden for their annual fundraiser. I had a lot of fun with this piece- a watercolor and english porcelain tribute to my grand fig tree in our back yard- the first thing about my house that I fell in love with. I knew that I wanted to include porcelain and watercolor on this 10" square canvas and spent a lot of time wrapping my head around how to do so. In the end, I made a watercolor painting which I adhered to the canvas and accented the painting with porcelain. I made small fig tiles, dug up an old plaster mold that I'd made fifteen years ago (I couldn't believe I still had it!) for the deep blue figs, and scoured the back yard for any leaves I could find under the now-bare tree to give texture to leaf tiles. I've enjoyed learning to treat the cobalt oxide wash as a watercolor and I love how the painted 2-D fig tiles turned out for this piece- something I've been playing with for the last year and will continue. I sewed the tiles on with bookmaker's waxed linen, which was a bit of an adventure in itself. While I was not able to attend the event (I spent a full day glazing and needed a fat nap by its start time), I really enjoyed the process of stretching my painting and surface skills to create this piece. I'd like to make one sketchbook/watercolor-inspired piece of pottery each month, a more manageable series than one each week, given how rapidly booked my calendar is becoming. At the very least, it is a nice break from production work, even at my limited production scale. Valentine's day is just around the corner and I'm working with my friend and collaborator Martha on a sweet little Valentine's sale/open studio. I was looking through some old images for an application this morning and stumbled upon this little gem from several years ago. I'll be revisiting, both the line and the cookie! One of my favorite projects last fall was a large order of quote cups for some local friends. I knew, as soon as I read their chosen quotes, that the Dickens would be perfect for valentine's. * A loving heart is the truest wisdom* Love is all important, but I'm not a fan of mushy sentimental depictions. Love shown through actions and intentions is one of my guiding principles. So I've been working away at these cups, which, by the way, are a form I developed just for my friends, and I'm really in love with. The limited edition cups feature red script rather than my usual blue, and are available only online (starting next week) and at our sale (2/5-6) through Valentine's Day. When they're gone, they're gone. Have a splendid week, friends! 2016. This morning I am beginning my year as I plan to go through it- a spell of quiet, a bit of painting, some planning. 2015 was crazy and wonderful and challenging and knocked me down more than once. It ended splendidly. I felt so supported and grateful for clients and friends near and far who did their holiday shopping with me. After mid-October things were a whirlwind and I dropped my plate project, dropped daily sketching and painting, even dropped running ; I focused all of my attentions in the studio and on keeping my family life running as smoothly as possible. I took the last week to reflect on what worked and what didn't, and for the first time I'm following several of my friends in choosing a word to guide me this year. I try to always keep gratitude foremost in my mind, but this year I want to make more. Not just pottery, though that is primary, but I want to add more sewing to my knitting, and I want to remake parts of my home to better suit our changing needs. I have a dear friend who is part of a group of people that I joke came with my marriage- my husband had a full adult life in Memphis before we met, married, and moved back from Mississippi. This group included a bookclub, which is the core of our social life here, and one of the long-time members offers gallery space to artists in her business. She has graciously given me the opportunity to have my first not-cups-and-mugs show in the spring, and today I moved from thinking about the work to making it. I'm excited to work on a larger scale, in both ceramics and in sketches- both watercolor and oils. Another goal for this year is to check in more here. I was haphazard in my writing last year, feeling pressed for time, but I found that I missed writing. It's also time to give this space a refresh; I'll be working on that in the coming days as well. Oh my it has been a long time since I've been in this space- a shamefully long time! I've been getting ready for the holiday season and just made my first sale postcard order in years and years. Coming up first is a fun pop up shop at Me & Mrs Jones at the Cooper Street store, on Friday, Nov 6I'm really looking forward to seeing the collaboration two friends, a painter and a floral designer, have been cooking up. I have some floral goodness up my own sleeves- I've been having fun with some small bulb pots- really loving the quatrefoil shape right now. They're perfectly sized for paperwhites or hyacinths. I'll have them bundled up for easy giving beginning in November. I'll also have plenty of Memphis map pieces and I'm bringing back the Memphis love ornaments from last year, as well. I have been working hard this month to build inventory and to keep working on surface design skills (and, frankly, forms), all while managing back to school transition (we started on the 10th) and I was fortunate to have a friend be an intern for two weeks and get some of the heavy lifting chores (resurfacing kiln shelves, mixing glazes and slips) out of the way while I had help. I have a ton of ideas swimming in my head, and plans on paper, and a production schedule to meet to get work into my local retailers' shelves, in my online shops, and for fall and holiday events, plus planning for shows and applying for opportunities in 2016. August has been a heavy planning month. But I do have a stack of plates to show you, which has me fairly well caught up for my weekly plate goal. This is another of my sea and stone pieces, porcelain, thrown on the wheel, but roughly. It's the last piece I made using underglazes. This one is fairly large, 12" across, with carving and inlaid sea glass. I have completely run out of my underglaze mixes, and although I like the watercolor effects it gives me, I'm leaving it on the shelf. I am much happier with these slip-coated pieces. Helen and I mixed up a batch of slip last week and I dipped several small slab dishes into the slip and carved them. I think the look is both more uniform and more subtle, and even though I tripped last monday, fell, and sent this little plate (#33) crashing to the driveway, I feel like this is a better piece, and more representative of what I want this work to be. There are still some little issues to work out (like catching the piece in the sweet spot of just leather hard so that the slip fits and dries (and then fires) well, but I like where this is going. A lot. And never fear, I'm still working in cobalt. I have been enjoying the work of several watercolor artists on IG and noticed several hand-painted renditions of toile in the past few weeks. I haven't gone crazy with the all-over pastoral scenes, but I do like this little bird on the colored ground. There's a cup that goes with this, and I plan to play with this a bit more in the coming months. This is my new porcelain, which I like so much I shoved aside the other three clay blends I bought in July and bought 200 more lb to see me through the holidays. I'm thinking that everything that gets a colored glaze(or slip) will be in one of the nice stonewares, but blue and white work stays on porcelain. This is plate 34, a 10" plate. And finally, plate 35, which brings me completely up to date. I also have to thank IG for this idea, particularly these streams. I kept thinking about maps and Memphis and finally sat down and carved two rubber blocks with the map of Memphis- including rivers, major parks, the beltline, and major roads. There's a small block- 5x7- which fits small plates like this little porcelain dessert plate- and then a larger 11x7 block for bigger plates, platters, and tumblers. But that's a post for another day. I really like this, and will have them out and about around town in the next few weeks. That's all for now. Have a lovely week, friends! In mid-July I took a one-night down and dirty screen printing class at a cool studio in Memphis called Five in One Social Club. This was my second class, the first being an indigo dye class (blue and white forever, you know), and I've learned so much and been inspired by both experiences. Last week I shared my hand-painted moth plate and told you about the screen print I did. At the class I made a print on a tea towel and a tote bag, but wondered how underglazes would work. Brilliantly, it turns out. To celebrate the first day of school I had a little printing party. I love the single print in the center, but I also like the idea of repeating the motif. Clearly, I have a bit of a learning curve with placing the screen to do a good repeat, and in a bit, before I have wheel time, I'll cut and lay these printed slabs of porcelain into their molds. In other news, I am restocking and renewing my etsy store this week. I've been off Etsy for a good long time but I'm ready to jump back into online sales. It will require a full day of computer time, which I always put off, but I think it's time to get back to it. My storefront here will remain open for the time being, but I may transition that over, as well. Stacked, you can see the smallest color difference between the two. The stoneware is on the bottom- a hand-painted moth plate (I've been a bit obsessed with these winged creatures- more of these soon, in various iterations). Porcelain, standard #213, is on the top. I'm not sure that most people will be able to see a difference between the two, but I do prefer the porcelain's brightness. The moth plate, an 8.5" luncheon size plate is number 29 of my 52 plates, is wheel-thrown stoneware (standard 240), which felt marvelous when I thew and trimmed it, and did just fine with my glazes (hallelujah). This is based on a page from my sketchbooks. I doodled with a brush pen late one night, looking up different moth shapes, inspired by a tiny silvery moth I frequently found floating in a friend's pool. The next morning, I repeated it in watercolor. Then I repeated it in cobalt on this plate. I also made it into a screen print, and I hope to have a series of these. I'm not sure how many of these I will make because they are time intensive, but I sure am happy with this plate (which is going up on my plate wall in the kitchen). 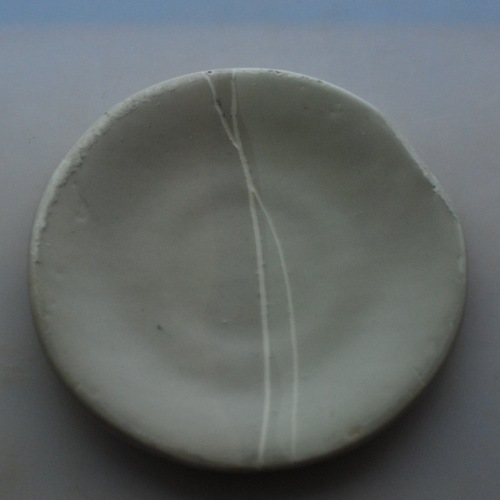 Plate 30, a small straight-sided tray (7") wheel thrown in (Standard 213) porcelain. It is *just* whiter and brighter than the similar stoneware is almost certainly what I'll be switching to for my blue and white work. Almost. I threw an entire bag of it in the last week and a half, making all of my forms, from tumblers to teapots to plates to berry bowls, and it performed admirably in both clear and colored glazes. I'm really tickled with it. I have yet to try to reclaim or handbuild with any of it, both of which are important tests. I am also tickled with these sea and stone pieces. They aren't ready to go out into the world, but I'm pleased with my progress and I love the watercolor underglaze and satin glaze. All of these pieces were thrown in the porcelain. I hope to have these available by October, both in person and online. This week I'm finishing up a small round of pint-style glasses- designed to hold a 12 oz pour - for the High Cotton pop up. I'm also finishing up a custom order I've been working on for the past year and preparing for the October Market at Urban Barn Market. And the holidays are just around the corner, despite blistering temperatures. So- later this week- pints and more moths. Have a good one, friends! Not much pottery happened last week. I cleaned up the house from my weekend sale (thank you, Memphis friends who came out! ), drove up to Nashville to get more clay (two new clay bodies to test, two old favorites to revisit) to replace the bad shipment of clay I got in January that crazed with every glaze I either bought or made, not even low-fire or lowest-possible-expansion ^6 glazes fit without crazing and water seeping through the cracks and wetting the clay body. (My friend Brit of Paper and Clay, a bright young thing who is really going places, and I have bought clay together from a supplier who refuses to do the right thing and admit that he sold us a bad batch of clay. We've each lost months' worth of work and hundreds of pieces because of this, necessitating a changing of clay bodies and adjustment of glaze recipes for each of us. But, ahem, moving forward.) As a result of studio madness and frustration since mid-April, I have four new clays that I've begun testing forms and glazes on. I did manage to get some glazing and shipping done last week, happily, including this piece. Ever since I returned from Maine last spring, these striped "luck" stones have been dancing around in my brain. I have piles of the stones in a bowls and platters in my studio, in the dining room, and tiny cairns around the house. I'm smitten. This June, on the plane, an idea hit and I've given myself time to play with this idea one afternoon each week. This plate, 28, is one of the resulting pieces, the first that I've been really happy with. I used a heftier stoneware on this piece (though I have also used porcelain and will keep playing with both clay bodies) watered down and mixed underglazes to approximate the gray granite in a watercolor-like wash, carved the stripes, and inlaid tiny bits of sea glass in the stripes, hoping that they'd spread only in the stripes. My first efforts, glazed with my regular gloss glaze, weren't quite there, but last week I finally mixed up a satin/matte glaze that did exactly what I wanted it to do. I'm just tickled with this little plate (it's about 9" in diameter) and can't wait to pursue this line further. I'm continuing to play with my sea glass collection in other applications, as well. I was recently reminded that glass can either work or not once fired- the pieces that are embedded seem to melt and adhere well, but larger pieces risk poor fit and can pop off. It is great fun to experiment with on art-pieces and on the exterior of functional pieces. My larger pieces of glass are in a vintage wooden bin on my finished ware shelving and the tiny pieces I'm using on the outside of cups and these stone pieces are separated by color in a vintage aluminum ice tray. The afternoons I spent sifting through this year's glass haul ( all but 1/2 c of tiny pieces in this photo were from this year!!) were a pleasure. We are in the dog days of summer in Memphis. Highs in the upper 90s with at least 70% humidity means we have heat indices over 100 daily, and in the studio, this means that my work dries out quickly (everything has to go into the damp box). In terms of production, it also means that I can only fire the tiny kiln - and that at night- so things are slowing down a bit until the heat breaks in September. But this week I'm throwing all of my forms in the two new clay bodies and am getting ready for fall events and the holidays, as well as exploring options for 2016. I'm not sure how I managed to skip the entire month of June, but here we are, into the second month of July. Summer has sped by, and mentally, I am still partially living in downeast Maine. We had such a nice trip and by the time I was repacking (and shipping) to come home, my fingers were itchy for clay. I kept my watercolor and pen and ink sketchbook religiously on my trip, and I have so many ideas to play with. As promised, I'll share two of my plates that went to Maine as gifts. First, #23, a tiny porcelain plate and egg cups set that I embedded with sea glass from my last trip to Maine. I found these sea gems at Cape Elizabeth, on a "secret" glass beach a stone's throw from a heavily-visited tourist spot. I love how the glass runs and pools and will keep playing with it this year. I brought home at least 10 lb of glass, in both large chunks and tiny gem-sized pieces. Plate 24 is something that I will definitely make again. I gave this handled tray/plate to my friend Betsy, because I credit my sea stone love to her old Flickr photos. Very sadly for me, by the time I got this piece to Maine it had crazed like mad, even though I mixed up a supposedly no-craze glaze for my problematic batch of porcelain. It was fine for a few days, but a week later, the surface spiderwebbed. Fortunately, one rarely serves liquidy foods on trays like this, so. . . . Anyway, the stones are simple rubber stamps I carved after my trip last year, and I mixed up underglaze to approximate the deep gray of the granite stones. Shortly before I left, I opened a box of stoneware that I used to use to see if it would work for me and threw several things- a batch of tumblers and mugs, and this plate (#25, lower right), which I coated with a cobalt oxide wash and carved. It worked well with everything, so I think that I will be going back to it. To the right (#26) is the same clay body, with some simple notches carved in and a coating of sea glass pieces. I was tickled to see that the pink/lavender kept its color during firing. At top, a plate (#27) from the good batch of porcelain, painted with the rugosa roses that were just beginning to bloom on our trip. I can't tell a major difference in the texture or color between this porcelain and the much-easier stoneware, so I will probably go back to this when I buy more clay next week (because I am slap out). This is the 28th week of the year and I have been playing with ideas from Maine. I've offered peeks on my Instagram feed, but I hope to show you more next week. If you are local, I'm having my annual summer sale this weekend, beginning this evening at 6, and continuing Saturday from 10-4. Drop by! In early May, I discovered that the clay I'd been using for nearly a year seemed to have changed. It decided that it did not want to work with my glazes anymore - either recipes I found, made, tinkered with that had been perfect on the last batch of clay, or with commercial glazes that I'd been using for years. Once I was recovered from Urban Barn market, I decided to test the two batches of clay that I was using, plus a stoneware that I used to use, and English porcelain. Over the course of a few days, I threw familiar forms in multiples- plates, tiny plates, small cups, bowls- to test with the various glazes. Happily, everything seemed to work well. I have 300 lb of clay that didn't fit with my favorite clear glaze, but I found a substitution that seems fairly happy. I still have more pieces to fire and glaze, but I'm pretty pleased with what's happened so far. There were a few specific problems that I think are working out, but I'll have to tackle them after I get back from Maine in mid-June. I was thinking about etched glassware when I made this - specifically grandmother's old precious fostoria crystal. Sadly, the design just didn't show up in this color that I love. I'm going to keep working on it, but this piece didn't work. Also, it's time for a studio deep-clean and organization to segregate my cobalt brushes from all of the others. Too much contamination going on here. Ironically, I'm wondering if one way to save this piece is to brush in cobalt into the lines I carved. We'll see. this little plate, #19, is also english porcelain. I drew lily of the valley and inlaid with cobalt wash, then sadly decided to once-fire it, trying to rush the process, and the finish is more like salt-glazed pottery than smooth, shiny pieces. I gave it to a friend for her 40th birthday so did not take a picture with good light and my real camera. But I know I'm going to use this imagery again, and I have high hopes for it. Plate 20 is a big porcelain dinner plate that was such an experiment for me. I almost glazed it in white or clear, but at the last minute decided to use my aqua glaze because it was one that had played badly with my regular porcelain, which I used the "good" batch to make this plate. Before trimming, I pressed small pieces of seaglass into the wet clay and just let it dry after trimming. No drawing, no special treatment. I knew exactly how the plate would look in white or clear (and honestly, I would have liked the end results better), but the way the glass pushed the aqua glaze out of the way is so interesting to me. I'm considering adding a few more pieces of glass to the top of the plate an refiring it so that there's more glass and the plate looks less like a clock. It was a very interesting experiment, and I'm looking forward to playing with more seaglass. Twenty one, small porcelain plate in the new batch that didn't respond well to this commercial glaze, and sure enough, it is full of crackles, despite the fact that I applied the glaze really really thinly. I made a matching cup out of english porcelain and used the same glaze (but cracked the darn thing), and it didn't craze at all. I believe it is a bad batch of clay. These two plates are so small I'm counting them as the same, #22. The larger saucer is my old good batch of porcelain, with glass embedded in the sides, glazed in clear. I really like how the glass runs down the sloped sides. The second, top dish is the size of an antique butter pat dish, and I made it with the trimmings from the english porcelain. English porcelain is lovely and beautiful but it does NOT like to be reclaimed. I try to collect the trimmings whenever I throw with it, wad them up, mist, wedge, and then immediately throw a little something with them. On this piece I dipped it in my favorite clear glaze then scattered a few tiny pieces of glass on the top. It feels very organic and very made by someone else besides me. Lastly, I want to share a cup that I'm just crazy pleased with, that combines my love of drawing and detail with this unpredictable glass. This is English porcelain, again, and I drew a rugosa rose all over the cup with a pin tool and filled it in with cobalt wash. Then I pressed in small pieces of sea glass and let it dry. The next part terrified me. I ran it under a trickle of water to sponge off the extra cobalt to minimize the transfer that I never can see until after it's fired. Bisque, favorite clear glaze, and Oh! Look what happens where the glass moves over the drawing! I just love it and want to play with this more over the summer. I have two more plates to share, but they are gifts that I'm taking to Maine, so I'll share them when I return. Good morning! I wanted to pop in and share a project I worked on early this year with Gokben Yamandag, a delightful Memphian with an international background. She is a native of Turkey and has lived and studied in London, Copenhagen, Mumbai, Paris, New York, and finally settled in Memphis where her day job is running the interactive arm of a large advertising agency. She has tremendous style, which is where we get lucky, because Gokben has developed an online boutique bringing independent artisans into our living room. I am honored to be a part of the launch of her boutique, Lesouque, and even more pleased that a portion of each purchase goes directly to the Malala fund. Gokben says that she was fortunate to grow up in a progressive part of Turkey, where she was encouraged and expected to further her education, but realizes that this is not the case everywhere in her own country, or in much of the world. Girls' education is a cause close to her heart (as it is to mine), and is an important part of the mission of Lesouque. this shot is my favorite- dessert plates, bud vases, and tiny butter-pat sized dishes that I use for spoon rests, tea bag holders, and to hold peach, olive, or cherry pits at the table. Bud vases, sold in sets of three, are perfect to keep on hand for impromptu happy gifts, hostess gifts, or to accent place settings. 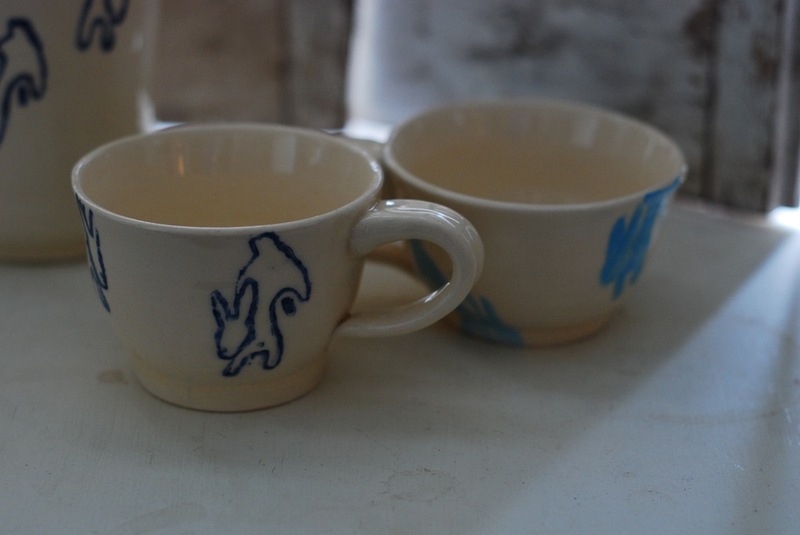 And finally, my porcelain latte cups, inscribed with a cheery greeting for your morning cuppa. Please sign up to get a preview and rewards for sharing this new venture. I wish you best of luck, Gokben! Hello, and happy Wednesday! I am overwhelmed with the positive response to the Urban Barn Market and so pleased with how I did, as well. I've taken the last two days to recoup, unpack (I'm still doing that), and reorganize my studio, as well as update my inventory in my shop. I'll continue adding things for my out-of-town followers, as well as for those of you who couldn't make it down. I'm planning a late May evening open house to show off some larger pieces - platters, pitchers, teapots, and serving bowls- just in time for wedding gift season. This morning I put up the first batch of my berry bowls. It's been several years since I've made any of these, but more are coming as soon as I get my clay issues sorted out. I've narrowed my palate to white, cobalt, and aqua, with the occasional blue-splashed bowl, as you see here to the right. My next batch will include quart-sized bowls, and a greater quantity of color choices. Urban Barn Market begins today! Good morning! I spent most of yesterday setting up for the inaugural Urban Barn Market at the Woodruff-Fontaine House in Memphis's lovely Victorian Village (I'm in the carriage house, right as you come in). Y'all, there is So. Much. Good. Stuff. I took just a single photo with my phone yesterday, and I'm about to go do some last-minute setup before the show opens at 4 this afternoon. Tickets are available here or at the door. Friday tickets at $15 get you in all weekend long. Saturday and Sunday tickets are $5. I am so proud of my friends Debi and Carrie for pulling this together, and all of the event styling Kristin (Everbloom design, please check her out!) has done is just amazing. If you're local, I do hope you'll stop by and say hello. If you aren't, check out the goods on Instagram (#urbanbarnmarket). Have a lovely weekend, friends! Hello! This weekend is the inaugural Urban Barn Market and I have spent the last week finishing, firing, and glazing. Yesterday I did my last glaze and I just unloaded the big kiln to refill, fire, and have time for one last firing for anything that needs a touch-up. And well, let's just say it will. I have been just in love with the porcelain I've been using since last July. It throws like stoneware, is nice and white, reclaims better than English porcelains, and looks lovely with all of my favorite forms. Someone gave me the most beautiful clear glaze I've ever used about a month ago. It stayed suspended, went on smoothly, didn't drip or splotch or anything. It was wonderful on cups, teacups, vases. Really bad on flat plates and platters, but I thought that firing a tad hotter would fix it. Temporarily, it did. I talked to some very experienced potters in my neighborhood and tinkered with the recipe, to no success. Found a glaze that was less delightful, but worked ok, and I decided to just go with it and some leftover commercial glaze I had from a large order last year and finish up my work for UBM. I always let my kilns cool for 24 hours to reduce any chances of thermal shock (I learned this the hard way), so as I began unloading this last colorful kiln, I was dismayed to find all of my white, aqua, and cobalt pieces (two of these are commercial glazes), plus the very few pieces I glazed in commercial clear, covered in a spiderweb of crazing. Friends, this spring has been a period of painful learning experiences, and I am slow to learn. It's the clay. The first batch I worked with, of which I still have 75 lb, have been lovely. The last batch doesn't fit with anything. I buy my clay with another potter, and sure enough, she has been having similar issues. I am almost relieved to learn that our problem is the clay and not the near-perfect glaze. Almost, because this means that all of the work waiting to be fired will need to be fired hotter and it still may not fit right. Onward. I do have plates to share with you. Plate sixteen is a handbuilt, octagonal plate that I painted in a floral cobalt inspired by my favorite Japanese textiles. It is glazed in a commercial clear glaze, and even though I dipped it, it's pooling strangely and it's crazing. I'm going to refire it and see how it does, but overall I like it. I don't seem to tire of this pattern, happily. Plate seventeen is my favorite in this series, and I'm keeping it. It's the last thing I finished before I went to the Country Living Fair a few weekends ago. I drew into the not-quite leather-hard piece with a pencil and walked away to do something else. When I came back, I noticed that the lines I drew were fairly deep because the clay had been wet, so I left it for the weekend. On Monday, I took a dry brush I use for covering faux bois pieces in cobalt and dry brushed the piece so that if left cobalt deposits over the entire plate/tray. After bisque firing, I washed the excess cobalt off, then dipped it in commercial clear glaze. Again, crazing issues, but I'm happy with it for my own use. The cobalt is quite dark in some places, nonexistent in others. It's much more loose than I usually work, but I love the end result. I hope to pop in later this week with a preview of what I'll have at the market. Please visit Urban Barn Market for more details if you're in the Memphis area! Good morning! I want to begin with introducing you to what I think may be a new series for me- I know that I run through designs pretty frequently, but I get bored with painting the same thing over and over. This is one reason that I've narrowed my palate to blue and white and aqua. If I can't keep making the same work, at least it can coordinate. I *think* I'm beginning a series of native botanicals. Right now I've done elderflower, crimson clover, native brier roses, and blackberries. I took some pictures of the buckeye, full of bees, this morning while I was walking my dogs and may add that to the mix later this spring. I've enjoyed limiting my palate and stretching the cobalt oxide wash- using it watered down and with more intensity- to create different effects. I've used the crimson clover motif for some time, but I am really enjoying the elderflower that I painted a few weeks ago in my sketchbook. All of these cups (and some platters, teacups, and bowls) will be available on May 9 at the Urban Barn Market in Memphis. I'm still working on my plates, many of which will be for sale at the Barn Market. I have three more plates to share with you today. Plate thirteen could also be part of the flora series, though it's not native to the south, fennel has certainly naturalized to the point that it seems native. My neighbor has a huge stand of fennel in her yard to attract butterflies, and I like to collect the blossoms and seedheads for flower arrangements. This is a 12 inch porcelain platter that I left fairly rustic. I smoothed the surface but left my throwing ridges, then painted and drew in fennel blossoms and seedheads. I used a tiny liner paintbrush, a pin tool, and seamstress' tracing wheel, but didn't add the inlay. I like the texture and looseness in this piece, neither of which come naturally to me. Plate 14 is also more of a serving platter, and one that I believe I'll repeat. It is essentially a short 10" cylinder with cutout handles and carved cobalt faux bois. I really enjoy using trays, especially during porch season, and I can see this one getting heavy use. I haven't decided if this is one that I'll keep or let go, but I'm leaning towards keeping it! Today's last plate, #14, is also a 10" porcelain plate. These days I have Maine on the brain, and looking forward to this year's vacation and thinking about all of the flora I loved from last spring's trip, I pulled out my forget me not stamps to decorate the rim of this plate. The funny thing about working with cobalt is that you don't see where it's transferred, invisibly, to your plate until after it's been fired, and sometimes you don't see speckles and smudges until it's been glazed. Cobalt is teaching me to both be more conscientious in the studio and to loosen up and just accept what happens. The interior speckles on this plate are a perfect example of this. Not intended, but not a calamity, either. This week I am testing more clear glazes- a new perfect-for-cups glaze crazes like crazy on flatter pieces, and my old perfect clear began giving me problems. Today I'm testing two new clears on small saucers and trying to finish up throwing for May's big market. Enjoy your spring weather, friends! Generally, if I am thinking about sketching and painting for pottery purposes, I use a blue pen or blue paints- gouaches here, because my watercolors were in another room and I didn't want to stop and gather them up. As soon as I finished adapting the chintz design, I grabbed one of the tumblers I made last week and painted the image onto the cup. I have a large elderberry in one of my front flowerbeds that I've been training into a tree form. They're weedy here, but I love the clusters of creamy blossoms and the late summer set of dark purple fruit (and I love the elderberry syrup I make from them to take when I'm feeling a virus coming on), so I keep mine pruned back to a manageable size and a fountain-like shape. I'm not sure anyone else will want an elderberry cup, but I've made one and will almost definitely add it to my blue botanical series I'm building this year. Thinking about how valuable this sketchbook is to me, made me think about a conversation I had some weeks ago with a friend about sketchbooks and different people's sketchbook practices. This friend talked about a sketchbook lending library wherein people would check out a book, add to it over a period of time, then turn it back in. I admittedly have a hard time letting things go (my mother just gave me a box full of sketchbooks from highschool), but I was horrified by the idea of losing my sketchbooks because I refer back to them so often. Here are the three books I'm using right now. There is actually one more, but it is downstairs in a bag. Opened, you can see that one is handmade- the bottom book is made of a recycled book with the block cut out, watercolor paper, and sewn in. I made it this summer when I took this class as a pick-me-up after finishing a big commission and I was feeling a little cross-eyed. I'm picky about this one- I WANT it to be pretty, but there are definitely some duds. Generally, because I want it to be something I enjoy looking at, I work at unlovely pieces until I'm happy with them, but there are still plenty of duds, and it's all practice. The next book, the Fabriano, is probably my favorite everyday sketchbook. The last time I bought them I bought several because my art store had a hard time getting them. I really like the textured paper, and that there are 30 pages in 12 sections, so it is perfect for an every-day sketchbook, and it comes in both 4x6 and 6x8, which is what I have. I take notes for ceramic techniques in it, sketch out ideas, and I'm not at all worried about whether or not it's lovely. These are the sketchbooks I'd hate to lose. The third,a tiny book, is one I buy in multiples and keep in my purse, knitting bag, car, everywhere. Right now I have this small 3.5x5.5 and a larger 5.5 squares active. The bright blue binding is why I first bought these journals, but I like the thick creamy paper. I generally only use pens in these (pigma microns are the ones I really like, but only in size 01), but I think I might try watercolors in the square version. I also have the ubiquitous moleskines everywhere, and a watercolor moleskine that I haven't jumped into yet. You can see that they're well used and bear the marks of living in the studio, as full of clay on the inside as on their covers. Tomorrow I'm planning to join a sketching group at the botanic gardens. I have so few pages left in my homemade book that I think I'll take it so that I can begin a new book sooner! Happy weekend, friends!